It seems like each year my oldest son chooses a food related costume, which is always a fun project. 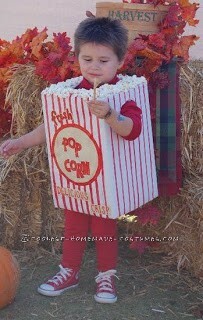 This Theater Popcorn costume was my first one, and I loved seeing him in it just as much as he enjoyed wearing it! I started by measuring the holes for the head and arms, then cutting them out. Next, I wrapped the box and covered the holes so nothing would irritate my son’s neck or arms. After the box was covered I started adding the detail and picture of what a box of theater popcorn looks like, I glued popcorn on the top. (which my son kept trying to eat off). It was a pretty simple costume, and he was more than excited to wear it!